What's the Southern Cross Cable? It's a submarine cable linking New Zealand, Australia, Fiji and the U.S. (Hawaii and mainland). It's owned by Telecom New Zealand (50%), SingTel (40%) and Verizon Business (10%). Of course it doesn't look like that at all... But you get the idea. This short documentary is worth thirty minutes of your time. Lots of insights from people who worked in one of the most iconic technology company ever, IBM. The IBM Centennial video video shows people who participated in the shaping of the company, and the shaping of our future. Vodafone Australia folks, make it clear! One bad thing about the low quality newspapers we have here in New Zealand, trying to inflate the number of pages available online is that some of the articles are just a syndication of their Australian counterparts, without bothering to adapt those articles to local reality. - "Vodafone dealers pose as customers"
- "Vodafail submits damning Vodafone report"
- "I hate going to work: Vodafone dealer"
- "Vodafone sacks staff over database breaches"
- "Vodafone probes privacy breach"
- "Customers in Vodafone legal action"
Windows Firewall: it's there, in Windows XP Service Pack 2, Windows Vista, Windows 7, Windows Server 2003 Service Pack 1 and Windows Server 2008. Quite flexible, and it's free. Web Protection Add-on: as the name says it's not a firewall replacement, but another tool that will look at patterns on outgoing web requests, to find out if there's a risk of your PC being used as part of a botnet. Microsoft Security Essentials: free malware protection for Windows-based PCs, very light. Version 2 comes with network protection that integrates with Windows Firewall. The new version also allows users to set a CPU utilisation limit. The very simple UI hides a good product. Recommended. Avast: I've used Avast for years on my Windows PCs, until Microsoft Security Essentials came along. Good software, but overkill in some of the features. PC Tools Antivirus Free: free antivirus for Windows-based PCs, from PC Tools. AVG Free: a free version of AVG, offering basic protection (shameless plug for full version: we have a 10% discount available for AVG Internet Security). HouseCall: non-active antivirus scan. You download the program, and run it, without installation. I use it on my servers and sometimes on my PCs, just to be sure there isn't anything the other security features didn't pick up. RookitBuster: as the name says, it scans for rootkits: hidden files, registry entries, processes, drivers and MBR. Sophos Antivirus for Mac: as the name says, a free antimalware tool for Mac OS-based PCs. It also scans a Mac for Windows malware. iAntivirus: a free antivirus tool for Mac OS-based PCs, from PC Tools. It scans only for Mac OS malware. The picture in this blog post is from their site - PC Tools, if you have a problem with this please let me know. ThreatFire: An additional layer of protection targeting zero day vulnerabilities yet to be covered by standard scan-based anti-virus. Also from PC Tools. Norton SafeWeb for Facebook: this Facebook app will scan links in your wall and alert you if any link to a suspicious website is found. Windows Live Family Safety: configure your PC to monitor what your kids are doing online: activity reports, manage access to websites, games and programs. Even set time periods when they can use the computer. Norton Online Family: this is a tool for parents, to set house-rules and keep an eye on their children's online behaviour, as well as educate their kids on internet safety. The service can block objectionable content, give parents insight into search terms their kids use and help them learn more about how their children represent themselves on social networking sites. eMail ID: will add a checkmark to webmail clients and Outlook Express to show emails come from the companies they claim to be coming from. DNS solutions will work by blocking your PC access to a website by returning an address that will redirect your browser to a safe page instead. Note that DNS solutions may affect the ability of using your ISP's local cache and in some cases can cause sites using Content Distribution Networks to be very slow or not load at all. This includes sites such as Facebook, Twitter, and iTunes. OpenDNS: you can register your home network on OpenDNS and automatically block certain types of contents, as configured by you. Internet Guide: similar to OpenDNS, provided by DynDNS. Norton DNS: it leverages Norton SafeWeb database to block unsafe websites. Does not have custom category blocking, but it's easier to setup. Norton Safe Web: a free downloadable tool that identifies risky sites before users click on them in search results. It shows up as a small toolbar within either Internet Explorer or Mozilla Firefox. The free toolbar is powered by Norton Safe Web site-rating technology, the same one included in Norton Internet Security and Norton 360. CWShredder: remove traces of a wide range of browser hijackers. BrowserDefender: Another software from PC Tools, that will work on both Internet Explorer and Firefox to detect potentially unsafe websites. What are you using? If it's a good suggestion I will update the post with your links. Spam will be removed. It's that time of the year when we start thinking about pizza and beer... I have just posted about Geekzone Pizza 2011, again happening in Auckland, Christchurch and Wellington. More details for Geekzone Pizza 2011 here. Companies interested in sponsoring the even in any way (drinks, prizes, etc) please contact me. Don't leave to the last minute, as you get more exposure the early you get on! For the last few months I have spent at least a few hours every week trying to make Geekzone the fast as possible. I really believe the web needs faster websites, and the answer is not only on laying bigger pipes, but smartly using the technology available. There are many reasons to have a fast website. For the publishers I can think of higher position on Google search results, reduced bounce rates, improving time on site, and many more. For readers the most obvious is that instant gratification when they can try loading a page and start using it almost instantly. Our site is hosted in Auckland, mainly because 65% of our New Zealand traffic actually comes from that single city in the country. Also because it's closest to the point where most data traffic leaves New Zealand, which is one less hop for all our overseas readers (and we have a large number of those, almost 55% of the total visitors number). We implemented domain sharding, by creating domains for our css, images, avatars, flags, etc. This was later replaced with a CDN using a base domain name different from our main Geekzone one, so to create a cookieless domain, avoiding unnecessary data traffic when browsers requested those resources. I also spent some time changing our database schema, indexes and creating a session management that didn't rely on the standard ASP IIS session. This allowed us to increase the number of workers processing web requests. One of the best changes we made was implementing Aptimize, a server-side software that transparently optimizes our pages by automatically creating image sprites, CSS inline graphics, and other special tricks. Running Aptimize pratically reduces the number of requests by half when loading the Geekzone front page, and cut the number of requests in our forum pages down by a third. Don't believe? Check this test with Aptimize off and a test with Aptimize on. Aptimize also helped me create the CDN bits by automatically rewriting references to static resources to point to a domain of my choice. Those and other changes (including code changes) proved well worth the work so far. Average page load times were down from ten seconds to about six seconds (this includes overseas visitors), and New Zealand visitors see an average of two to three seconds load time. This includes the time to load advertising in our pages. But we still had some other tricks, but let's talk about something else before going there. Online advertising. Since 27th October 1994 we have lived with online ads. That's when HotWired ran the first banner ad on a webpage. Since then many content publishers, including myself, can only afford to continue providing their service for free because of banner ads. It's a common misconception that publishers make money only if you click an ad, and since you won't be clicking an ad then blocking banner ads won't impact publishers. This is wrong. Online advertising comes in many "models", including CPM (Cost per thousand), and CPC (Cost per click). In CPM models publishers get paid by the number of impressions of an ad, regardless of how many clicks it gets. So this clearly means that blocking ads prevents publishers from realising important revenue - money that goes into paying hosting, traffic, CDN, software, development, salaries, etc. Some time ago Ars Technica wrote an important article on why Ad Blocking is devastating to the sites you love. Back when the only way to access the Internet was on dial up people started using "ad blockers" because, seriously, any extra bit to download impacted on the time a browser spent loading a page. This is not true on bradband connections anymore. We are talking about seconds, down from minutes. And we are talking about seriously breaking the web when only large media companies could be able to run websites (and they still run ads on them anyway). I once received a tweet from someone saying "hey, the Geekzone layout is broken when I use ad block, any chance to fix the layout?"... I know that person. As in I have met him before. And I seriously think he wouldn't work for free. But he was asking me to help him with a problem created by his own action while blocking ads on my site. Sorry but I couldn't spend time on that problem, seeing I still have the "Speed Project", the "API Project", and many other things to work on the site. Things that actually cost money to create. Money he was blocking me from making. It's good for you isn't it? You can see our content in less than a second! I could be getting less ad impressions if you close the page before the ads are loaded, but at least I thought of you and presented the content first, even if it means a little less for me, right? But there's the law of unintended consequences... Ad blockers actually block the script that loads all other scripts in our pages, the "mother script". We use Google search embedded on Geekzone and being the search a script it will only show if it can execute inside your browser. And since the mother script is being blocked by ad blockers, our embedded Google search doesn't work anymore if you are running an ad blocker. Also logged in users have a "Geekzone Live" feature in our home page, where they can see forum updates as they happen, instead of the static front page visitors see. That script is also not working, because the mother script is being blocked by ad blockers. Since implementing this change I received many comments in our forums and in private. People are angry. They don't care the pages are loading in less than a second now. What they care is that search and live updates are not working anymore when they run ad blocking software. A few of these people actually think I made this change intentionally, to punish people using ad blocking software. No, I did not do it to punish people using ad blocking software. What they don't realise though is the only broken thing here is the ad blocking software itself. If they still want to run that type of software they should ask the developers to make it work with new web technologies, and keep up with times. Alcatel-Lucent has announced the publication of a user-friendly guide to understanding the potential of ultra-fast broadband (UFB) for New Zealand. Titled Ultra-Fast: Understanding the Next Generation of Broadband in New Zealand, the guide helps to answer some of the common questions many New Zealanders have about UFB. Like, "What is it?" and, "What will it mean for me at home and at work?" Shifting the focus away from contracts, layers and architecture Ultra-Fast: Understanding the Next Generation of Broadband in New Zealand looks at the potential of UFB for New Zealanders, in particular within the health, education and business sectors. 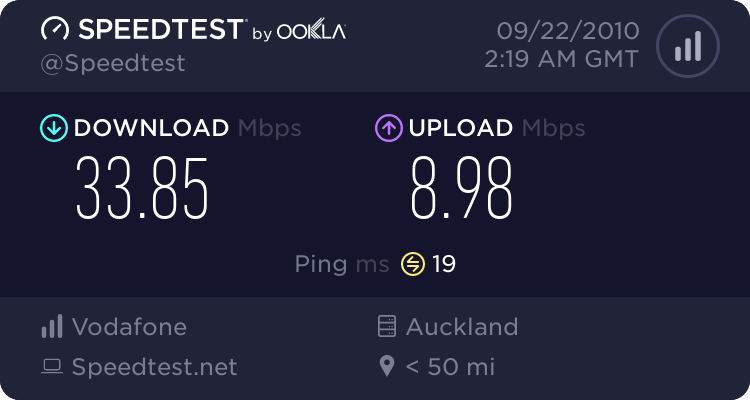 "People have said to me, 'what's all the fuss about UFB, it's just fast internet right'?" said Jyoti Mahurkar-Thombre, CEO Alcatel-Lucent New Zealand and Pacific Islands. "UFB is about so much more than just fast internet. I'm excited not only because it will allow us to do all of the things we can imagine with higher bandwidth like super-high-quality video calling - but also because it will allow us to do things we can't yet imagine." Students at Pt England School in Auckland, are already leading the way with ICT-enabled learning. Podcasting, blogging, television and cloud computing are well utilised e-learning techniques. "Today, Pt England School uses a mix of technologies to provide connectivity for students, however with a UFB connection delivered over fibre, the school will be able to take its pioneering learning approaches even further. There will be no limits," said Jyoti. The Ultra-Fast: Understanding the Next Generation of Broadband in New Zealand guide has been endorsed by the Minister of Communications and Information Technology, Hon. Steven Joyce, Crown Fibre Holdings and the Telecommunications Users Association of New Zealand (TUANZ). To download a copy of Ultra-Fast: Understanding the Next Generation of Broadband in New Zealand, or view the video please visit: www.ultra-fast.co.nz. 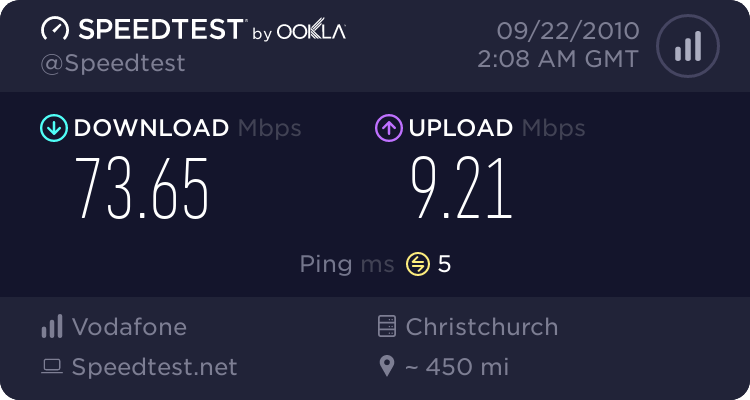 I am lucky to have been selected as one of the first people testing TelstraClear's new 100 Mbps-capable cable network (available in Wellington, Christchurch, Kapiti). The telco has upgraded its cable network to support the DOCSIS 3 standard, giving users access to 100 Mbps download speeds, and 10 Mbps upload speeds. One of the first things I've done was to start a discussion on Geekzone about it. But I will put a summary in this post - installation, infrastructure, performance, expectations, etc. Installation in itself is easy, since the entire network is now DOCSIS 3 capable. A simple modem swap and we are ready to go. My first modem was a Motorola, which is being replaced today with a Cisco model. All the screenshots are therefore based on the Motorola modem. Of course (like in any other network situation) you have to put a bit of investment here. My current router is a Cisco Small Business Pro SRP 521W. This router supports two VoIP lines, and WiFi 802.11n. I am noting this because when you get access to a faster network your router will be an important piece of the puzzle. How many packets can it process? How reliable is it? The 802.11n is important here. If you have a 802.11g router and use wireless as your main connection then you would already be limiting your bandwidth to at least half (nominal) or about one fifth (actual). More considerations on speed later (this is going to be a long post). Also we have two gigabit switches in our home network, and all our PCs are either ethernet gigabit capable or 802.11n capable. Interesting, right? 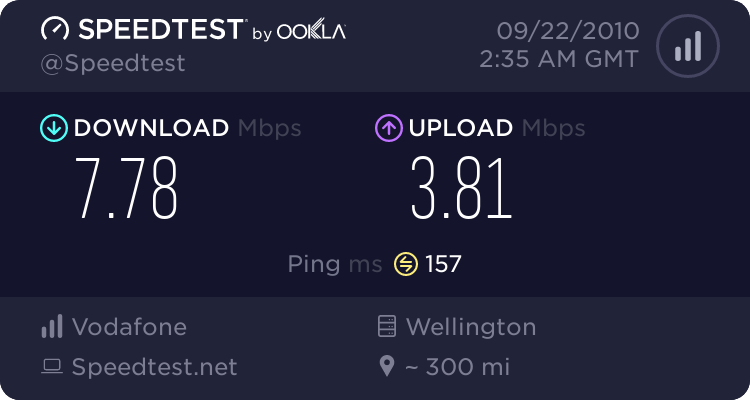 A speedtest to Christchurch gives me better results than one to Wellington, where I live. That's because of peering. 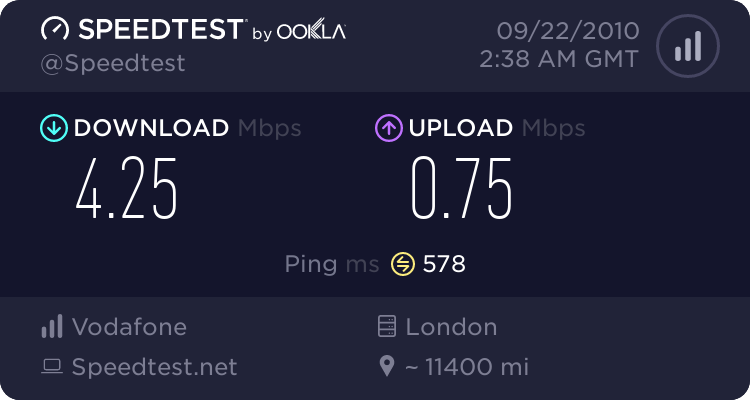 It's important to note (as in any other broadband service), what you get is a line speed. Final results will depend on how packets are routed, the capacity on the target server providing the content you want, etc. Obviously this is limiting but only uses portion of the bandwidth available. Right, so what do I use all this speed for? We already used a large plan (25 Mbps, 120 GB) with TelstraClear before. We have two adults working from home. We consume a large amount of online content, including at least two or more video rentals from iTunes. I have an online backup account, using about 130 GB and about 1GB uploads daily, mainly documents updates, Outlook PST files updates, photos and home videos taken with Flip MinoHD. We also have two VoIP lines here (VFX with WorldxChange and an Australian number with Mynetfone). On average we use about 100 GB a month. Count those 300 MB Apple mac updates, 100 MB Windows updates, MSDN downloads, a few LiveMeeting events every month, a few Skype video calls and you have a good idea of how much we use. The big question for me now is how TelstraClear can make this a more compelling proposition. Price of course is going to be of impact. In broadband world "you get what you pay for" is very true and while the existing 25 Mbps cable service is not cheap, it's of the highest quality. Other things are value added services. I'd really like the option of moving my online backup (provided by a US vendor) to a local service. 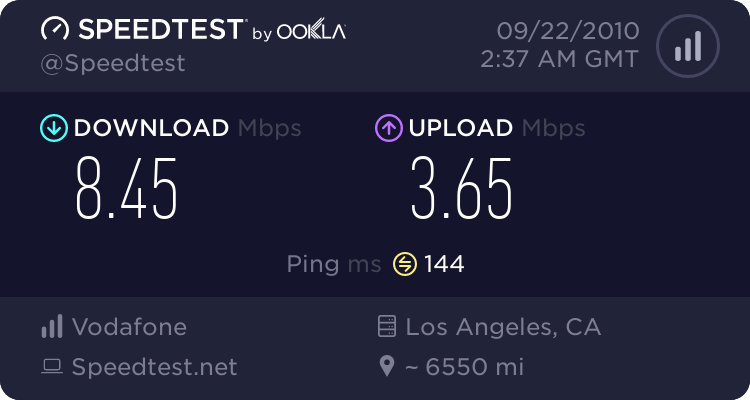 Obvious reason would be possible upload speed increase. 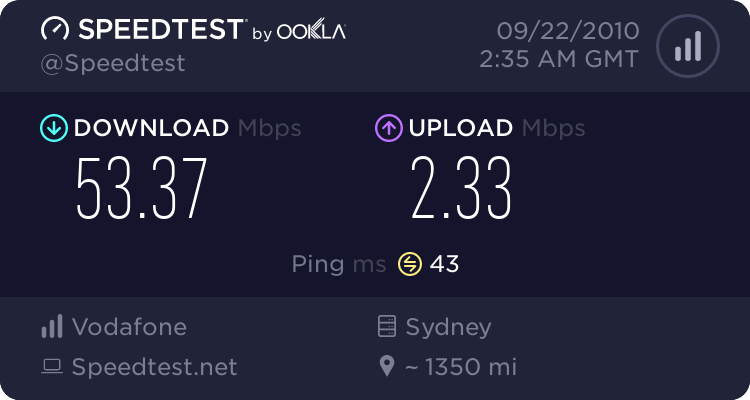 Even better if TelstraClear provided a bundled service with non-metered traffic for this service. Or perhaps TelstraClear could join forces with Microsoft and offer a hosted communications services (which I am actually going to be testing very soon, with another provider). I will post about this trial later with an update after changing the modem to the Cisco model. Full disclosure: I have been a paying TelstraClear customer for about ten years now. We are so happy with the service itself that when we decided to buy a house one of the requisites was to have a cable-modem service available at the new address. As part of this trial my current plan is not being charged, but I pay for any traffic over my original plan. This happened once in the first month because all of the downloading and testing I wanted to do.